So I wrote a poem for my writing class this summer. I sat down and wrote it without thinking. I didn’t let myself overanalyze, criticize, or edit. I didn’t stress over line breaks or punctuation or even the order of the stanzas. I blocked out the part of me that hates everything I write and forced myself to tell the story that had been brewing. I wrote it and I passed it in. It came back in a yellow envelope with the rest of my writing for the term, and my professor had written comments. Nix this whole stanza, she wrote, and I agreed because the ducks didn’t fit with the rest of the poem. Her biggest critique? Where’s the title? That was August, and I’ve been laboring over this poem for months now. My writers’ group critiqued it and Jon solved a huge problem in the last stanza: What if you used a colon to introduce what the narrator is imagining? We went back and forth over whether a word should be singular or plural, how to say the sun was bright without sounding trite, but the hardest part was the title. I told them I’d keep working on it, that titles are historically hard for me, that it’s nearly impossible for me to find one that isn’t heavy-handed. And every other week or so, I shoot Kate a text: What about this one? Or this? Yeah, that’s what I thought. I feel like I slink away with my head hanging because I should have trusted my gut on that one. Why is this title so particularly hard? I’ve been trying to wrap my mind around it. I think it has something to do with the simplicity of the poem. It’s not frilly. There’s no fanfare. It’s straightforward and real. Every title I come up with is not straightforward or real. They drip with sentimentality. If I didn’t care so much about this poem, I’d probably just slap on some sappy sounding empty phrase and call it a day. But I do care. It’s one of the few poems that left my head and did the work I wanted it to do. It did that work, but then it did more. It became its own creature. It got up and walked on its own two feet. I refuse to do it the disservice of saddling it with a cheesy label. So, whatever you’re doing right now, imagine me, sitting cross-legged in a green velour chair, wracking my brain for a title that is honest and clean and simple. 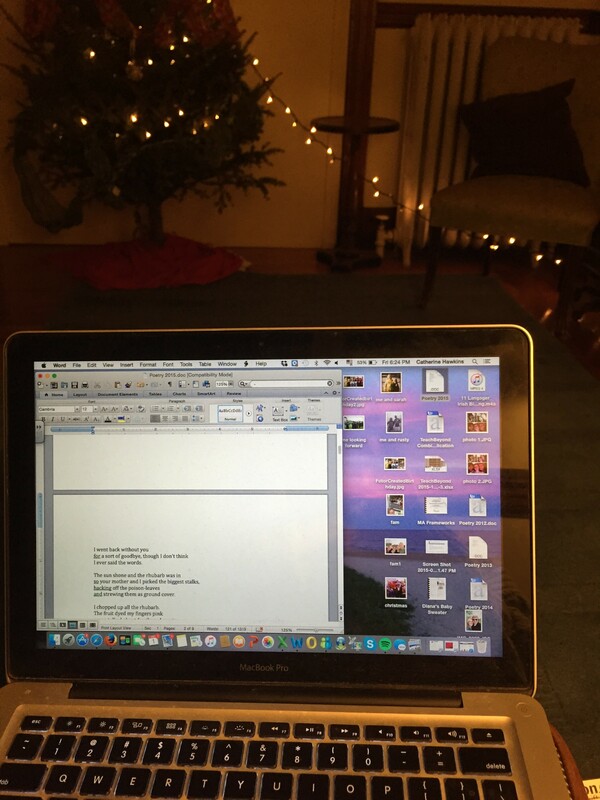 This entry was posted in poetry, writing and tagged poetry, writing on January 1, 2016 by catherine_hawkins.